The field of solid state characterization is central to the pharmaceutical industry, as drug products are, in an overwhelming number of cases, produced as solid materials. Selection of the optimum solid form is a critical aspect of the development of pharmaceutical compounds, due to their ability to exist in more than one form or crystal structure (polymorphism). These polymorphs exhibit different physical properties which can affect their biopharmaceutical properties. 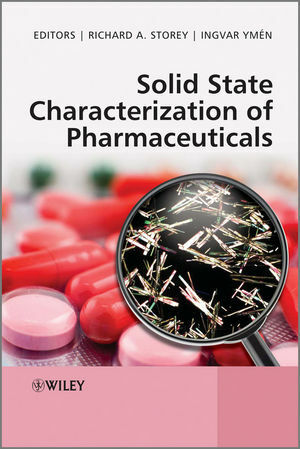 This book provides an up-to-date review of the current techniques used to characterize pharmaceutical solids. Ensuring balanced, practical coverage with industrial relevance, it covers a range of key applications in the field. 1. Introduction to the Solid State – Physical Properties and Processes (Ingvar Ymen). 1.3 Thermodynamics and Phase Diagrams. 1.4 Neutral Pharmaceutical Molecules in the Solid State. 1.6 Polymorphs, Solvates and Mixed Crystals. 1.7 Phase Transitions and Kinetics. 1.8 Screening for 'Polymorphs' (Ansolvates and Solvates). 2. X-Ray Diffraction (Chris J. Gilmore). 2.2 Generation and Properties of X-Rays. 2.3 Crystal, Lattices, Unit Cells and Symmetry. 2.4 The Interaction of X-rays with Crystals. 2.5 Collecting Intensity Data for Single Crystals. 2.10 Other Radiations: Neutrons and Electrons. 3. Spectroscopic Characterization (Andrew O'Neil and Howell Edwards). 3.4 Mid- and Near-Infrared Spectroscopy. 3.7 Chemical Imaging and Mapping Microscopy. 3.8 Nuclear Magnetic Resonance Spectroscopy. 4. Thermal Analysis – Conventional Techniques (Mark Saunders and Paul Gabbott). 4.2 Differential Scanning Calorimetry (DSC). 4.4 Dynamic Mechanical Analysis (DMA). 4.5 Determining the Melting Behaviour of Crystalline Solids. 4.7 Solvates and Hydrates (Pseudopolymorphism). 4.8 Evolved Gas Analysis (EGA) and Simultaneous Measurements. 4.10 Purity Determination Using DSC. 5. Thermal Analysis – Dielectric Techniques (Susan Barker and Milan D. Antonijevic). 5.2 Common Background to the Techniques. 5.4 Thermally Stimulated Current (TSC) Spectroscopy. 6. Isothermal Calorimetric Analysis (Andrew Hills). 6.2 Calorimetry: Principle of Measurement. 6.3 Applications of IM for Characterization of Solid-State Pharmaceuticals. 6.4 Analysis of Solid-State Form Conversions. 6.5 Analysis of Solid State Chemical Reactions. 7. Calorimetric Methods – Solution Calorimetry (Simon Gaisford). 7.2 The Principles of Solution Calorimetry. 8. Vapour Sorption and Surface Analysis (Jerry Y. Y. Heng and Daryl R. Williams). 9. Microscopy (Gary Nichols, Shen Luk and Clive Roberts). 9.2 The Microscope as an Analytical Tool. 9.3 Which Microscope to Use? 10. Particulate Analysis – Mechanical Properties (Ron J. Roberts). 10.3 Indentation and Nanoindentation Testing. 10.4 Deformation Behaviour of Powders. 10.5 Evaluation of Deformation Behaviour and Compressibility. 10.6 Solubility Parameters (d) and Cohesive Energy Density (CED) and Mechanical Properties. 10.7 Influence of Crystal Structure on Mechanical Properties. 10.8 Polymorphism and Mechanical Properties. 11. Particulate Analysis – Particle Size (Xian-Ming Zeng). 11.2 Particle Size and Shape. 11.6 The Average Particle Size. 11.10 Particle Size Assessment and Pharmaceutical Development. 11.11 A Case Study: Medicinal Aerosols. 12. Computational Polymorph Prediction (Sarah L. Price and Louise S. Price). 12.3 Are Some Crystal Structures Easier to Predict than Others? 12.4 Illustrative Examples of Crystal Energy Landscapes for Pharmaceuticals. 13. Patenting of Inventions Relating to Polymorphs (Bertrand Gellie, Claire Johnson and Thomas Weisbrod). 14. A 'Roadmap' to Solid Form Selection (Richard Storey). 14.2 Summary of Solid-Form Screening Process.